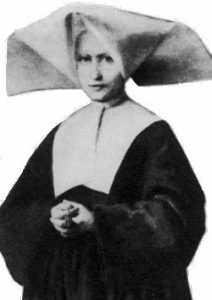 Saint Catherine Labouré was born on May 2, 1806, the child of Peter and Louise Labouré. She was the ninth of a family of eleven children. When she was nine, her saintly mother died. After living a year with her Aunt Margaret, Catherine came back to her father’s farmhouse as mistress of the household, where she worked diligently with great charm. On January 25, 1818, she made her First Communion. From that day forward, she rose at 4:00 am and walked several miles to Mass. She prayed, meditated, worked and served the family well until she was 22. It was then that she asked her father’s permission to become of Daughter of Charity. Her father flatly refused her. After a year, with the help of her Aunt Jeanne’s intercession, her father finally gave her permission to enter the convent. Then the vision of the Virgin turned completely around. on the other side appeared a huge M with a cross about it. The letter rested on a bar, beneath with appeared two hearts. The first heart was encircled by a crown of thorns, the second was pierced by a sword. Catherine understood this to mean that we have been purchased by a God who was crucified in the very presence of His own mother, the Queen of Martyrs. The Virgin spoke again. This time, she gave a direct order, “Have a medal struck in this form. All who wear it will receive great graces.” Catherine’s confessor obtained permission from the Archbishop to have the medal struck. On of the original medals is mounted on the Ambo of Saint Catherine Labouré Church. Catherine Labouré kept this secret all of her life, revealing it only to her confessor. She passed to her eternal reward on December 31, 1876, and was canonized on July 27, 1947. The first parish in the world to be named in her honor was Saint Catherine Labouré Parish in Harrisburg, Pennsylvania, on March 1, 1948. On July 5, 1976, the new Church was dedicated as The Shrine of the Miraculous Medal. The Feast Day of Saint Catherine Labouré is November 28.